Well, it’s now 2012 and we’re a couple of weeks into it already. How did your New Year’s resolutions work out? If you’re like me, you’ve probably forgotten half of them and screwed up most of the rest. It happens. Usually because we pile too much on ourselves all at once at the beginning of the year. But that’s a different problem. Today, let’s think about resolutions and how you can use some new ones to better utilize social media this year. #1 – Use social media to.. be social. 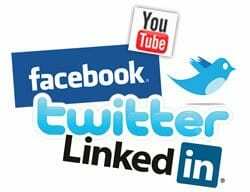 Not to gain a huge following or build a big network or drive more hits to your website.. just use social media to socialize. You’ll find that the other things follow once you grasp that fundamental. #2 – Share photos on a bigger network. Facebook is great and all, but you limit yourself when you post your photos there. Using a site like Flickr can mean much broader syndication of your photos across networks, allowing for more exposure and easier access by friends and family (or colleagues or whomever you’re targeting). #3 – Consider using an open license for your work. Rather than going with restrictive, heavy copyright protections on your blog posts and media, try using a Creative Commons approach instead. For those things you do for marketing and brand awareness – such as blogging – this can mean much wider syndication and thus more exposure. #5 – Watch the details. Many people get so caught up in their socializing that they miss important details. Like whether they did all five resolutions in a list. Stop and smell the roses once in a while.